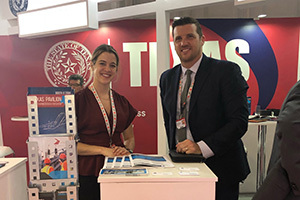 Atec and Vital Link Europe exhibited at the Farnborough Airshow from July 16-22, 2018. 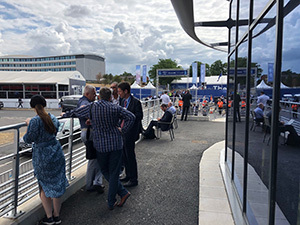 The Farnborough Airshow is one of the largest aerospace events in the world with more than 1500 companies exhibiting from over 52 countries. Atec and VLE were honored to be invited by the Office of the Governor to exhibit in the Texas Pavilion. The Atec and Vital Link locations in Texas helped to gain our invitation. VLE’s office location in Camberley near the airshow helped VLE to rotate Bas Greenwood, Josh Skinner, James Eggleton, Abdul Aziz Sheikh and Andy Cox to/from the tradeshow. 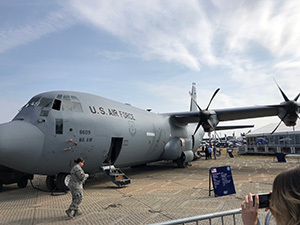 Mitch Theisen, Atec’s Minneapolis Site Director, and Katie Brown also attended the airshow. The show produced some promising leads for new test cell construction, as well as test cell mods. The companies have continued to see growth in the commercial aviation market, especially regarding large turbofan test cells. “It was important to be present at the Farnborough Airshow. We had important meetings with prospective customers about the need for test cells in EurAsia and Africa,” said Greenwood. VLE and Atec are increasing their production capacities and are hiring across all the Atec companies. This is a great time to join the team and be part of our record growth.